There are two completely opposite styles of organizational leadership, be the arena politics, war or the workplace. On the one hand, the image of a Napoleon astride a rearing, snorting noble steed, openly directing his legions, leaps before the imagination—larger than life, a leader visibly in complete control. 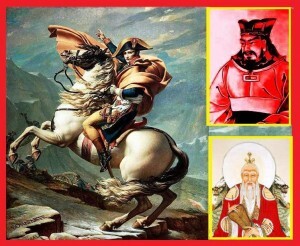 Napoleon vs. the two Tzus exemplifies two diametrically opposed ways of thinking about and exercising leadership, despite their comparable fame, historic credentials and success in application. Given the prominence of each of them, it is altogether natural to ask how they can both be right—or, more insightfully, to ask under what circumstances they are to be followed. These considerations can be distilled into one question: Under what circumstances should a leader—battlefield or workplace—lead visibly or invisibly? In this context “visibly” is to be taken not only literally, but also organizationally, in terms of top-down inspiration, guidance and control the source of which, viz., the leader, is evident to those inspired, guided and controlled. Influenced by “Great Man”, rugged individualist and heroic images of history and entertainment, Western cultures are far likelier to favor the Napoleonic approach to leadership as a model to be followed and as a tool of historical and organizational narration and explanation. From this Great Man perspective, failure of organizational leadership, as well as success, can also be publicly showcased prescriptively (as something to avoid) and descriptively (as an account of what happened historically, culminating in catastrophe). Cases in point: the role and style of FDR in successfully creating New Deal jobs in Depression-era America and the failure of Herbert Hoover tasked with the same job earlier. “The river carves out the valley by flowing beneath it. On the “Great Man” historical interpretation of this advice, a great leader should, at some point, serve as a great follower, just as Napoleon the corporal did before becoming Napoleon the emperor. That makes sense, because the corporal Napoleon could inspire other corporals not only because he was a role model for them, but also because their minds, desires and needs were once his, transparent and therefore easy for him to grasp, rely on and engage. A poor follower may make a poor leader, since (s)he cannot walk in the boots of the former as the first key step to wearing the mantle of the latter. If you do not feel or believe in the mystique or right of leadership when you are expected to be a follower, it will be very difficult to sustain or understand it as a leader. But Lao Tzu is not talking about climbing this kind of career ladder. His advice is more paradoxical than that: A leader leads by following, period, or by being followed without obviously leading.The modern analogue of the former is a president or party whose policies are decided by Gallup polls. As for the stealth leader, Lao Tzu saw a great leader as being more of a “gray leader”—an éminence grise (a “gray eminence”—a colorless, but secretly powerful influence on decision makers of the kind exerted by those who preside over things). Sun Tzu’s message is similar, but not identical to Lao Tzu’s. He allows for greater visibility, but with an appearance of effortlessness (a concept central to Lao Tzu’s Taoism) and therefore of a kind of ordinariness. A Sun Tzu and Lao Tzu CEO would have a folksy, unprepossessing manner and a seemingly unimposing hands-off leadership style—a kind of T-shirt, backstage leader. The differences between the two styles understood, the question becomes when to use them. When working with staff who take pride in their originality, creativity and autonomy, the best leadership may amount to not much more than permissions. When control from the top must be exercised, it may be disguised through skillful use of suggestion—planting ideas as seeds that will appear to sprout from the minds of staff, i.e., leading their horsepower to creative waters without forcing anything or saddling up to lead the charge yourself. Lao Tzu applies here. When a leader’s success depends upon being a role model, e.g., in multilevel or pyramid marketing, the Napoleonic model seems the clear choice—or perhaps is simply inescapable. Distributors or other agents at the bottom looking up, drooling and nipping at the top dog’s heels (or hooves) and success will, as a minimum, see him or her as leading by example, irrespective of whether (s)he is the boss or just a heavily promoted underling. When the leadership is through control as well as by role-model example, it will be harder for the leader to lead invisibly. If the organizational structure is “flat”, i.e., minimal or no hierarchy, bottom-up control is possible, e.g., through group and democratic decision-making, which can reduce leadership to presiding over proceedings and maintaining order. No rearing Napoleonic steeds here, just the subtle maneuverings and machinations of an éminence grise. When leadership objectives conflict with underling objectives, leadership will, as a minimum, have to be disguised, if not altogether concealed from the rank-and-file patsies. The directionality of information flow and control does not automatically determine the more suitable model—Napoleonic or Tzu. Both styles are compatible with unidirectional top-down control. However, the Napoleonic high-visibility approach is less feasible with bottom-up flow, as argued above, unless the leader’s role is merely to follow. The model to follow may, in some circumstances, depend less on the organizational structure or agendas of the leadership than on the existing level of stability or crisis. The Lao Tzu model seems better suited to calm times and situations to the extent that it capitalizes on the possibility of “percolation” and soft trickle-down control, rather than forceful, visible action and take-charge command. Martial law serves as a good example; the normally inconspicuous military becomes very visible in a crisis, as does its always operative, behind-the-scenes leadership. A business analogue would be manifest and forceful leadership to avert a hostile takeover. Likewise, if a start-up enterprise is running out of cash, otherwise invisible leadership will have to yield to take-charge, lead-the-charge fundraising leadership. A perfect niche for Sun Tzu’s effortless leadership is an organization in which making success look easy motivates followers and underlings. Once again citing the example of multilevel marketing, making achievement of the distributor’s or agent’s dream look easier than it actually is can be a key role for management in top leadership positions. When pondering the differences and suitability of Napoleonic and Tzu models of leadership, be mindful of the fact that whether you are a leader or among the led, having some understanding of which form of leadership is guiding or should guide your operations and enterprise can be very useful, indeed perhaps also necessary for your informed and wise participation. That’s because there is one thing worse than backing the wrong lead horse.